Since its debut in 1971, Michigan anglers have qualified for the Bassmaster Classic thirty six times and only six times in the last 32 years has the state failed to produce a qualifier. In fact, only 14 states have produced more Bassmaster Classic qualifiers than Michigan. However, before engaging in any inter-state trash talking, know that these statistics are significantly skewed by the fact that 23 of those 36 Classic appearances are attributed to one angler - Kevin VanDam. Exclude VanDam's numbers and Michigan's representation is a more pedestrian 13 appearances by 10 anglers over the 42 year history of the Classic. VanDam's run of 23 consecutive appearances began in 1991 and includes four wins, a phenomenal record of consistency and excellence against the best anglers in the world. That high level of competition motivates him to continually search for new and innovative tactics – and there's no better place to do that than the Classic. "I learn something every time, regardless of the location", said VanDam. Despite 23 straight appearances, VanDam never takes qualifying for the Classic for granted and relishes each appearance like it was his first. "I'm even more excited about qualifying for the Classic now than in 1991", he said. "As a young angler, you grow up dreaming about it." VanDam admitted to a bit of nervousness and anxiety upon qualifying for the first time, but overcame it by picking the brains of previous qualifiers. "By the time the tournament started, I'd spoken to so many people that I felt insulated and prepared," said VanDam. Prior to the arrival of VanDam, qualifying for the Classic seemed out of reach for Michigan anglers. Before Paul Converse broke through in 1981 no angler from Michigan had ever qualified – a ten year stretch of futility. In the years immediately following Converse's Classic visit, three other anglers from Michigan qualified; O.T. Fears – an Oklahoma native who at the time lived in Seney, Mich. as part of his employment for the United States Fish & Wildlife Service, Art Ferguson and Bob Hetz. Ferguson is still the only Michigan angler other than VanDam to fish the Classic more than once, qualifying in 1990, 1999, 2000 and 2004. In 2000 it seemed like Michigan pros had cracked the Classic code, sending four pros to the tournament; VanDam, Ferguson, Phillip Jones and Kim Stricker. But that accomplishment was never repeated and the state once again took a step back between 2005 and 2010, when VanDam was its lone representative. Several factors may contribute to Michigan's long absences from the Classic, but the most commonly cited are the shorter legal bass fishing season - which provides anglers with fewer fishing opportunities than competitors from other states - and unfamiliarity with tidal waters or the large, sprawling reservoirs which are often featured in the Classic or Elite Series events. Hook n Look television host Kim Stricker retired from professional bass fishing after the 2009 season, here at his retirement celebration during the 2010 Ultimate Fishing Show Detroit - Kevin VanDam was in attendance. Hook n' Look television host Kim Stricker acknowledges the difficulty in learning to fish unfamiliar waters and remembers the advice he received from veteran pro Cliff Craft leading up to the 2000 Classic. "Cliff told me it would take five years to learn all the different types of water", said Stricker. "But 13 years later, I'm still learning." On the other hand, technological advances, especially in sonar and GPS mapping, are helping to level the playing field. 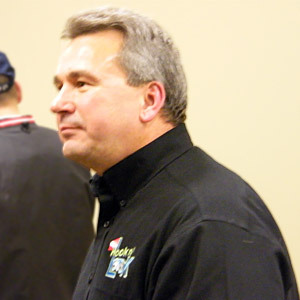 "Technology has greatly accelerated anglers' learning curves" says VanDam. Stricker concurs, citing technology that enables the underwater video featured on his show as well as the information technology advances that make it possible to access and share information from anywhere at any time. 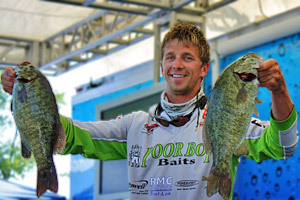 The drought for Michigan pros-not-named-VanDam ended in 2011 when Ryan Said qualified by winning the Bassmaster Northern tournament division. Like many first time Classic qualifiers, Said was admittedly a little in awe, saying "one of the biggest challenges for me, especially as a first time competitor, was just wanting so bad to catch a couple fish to make sure I had something to weigh-in. I probably didn't think as clearly as I normally do because of the pressure." Said's qualification seems to have paved the way for another wave of Michigan pros. 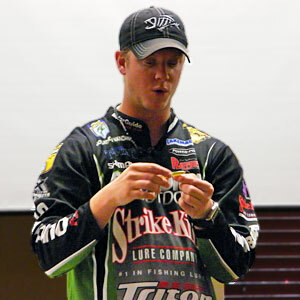 Kalamazoo Elite Angler Jonathon VanDam joined Uncle Kevin at the 2013 Oklahoma Bassmaster Classic, Jonathon's first Classic appearance, shown here demonstrating dropshotting the Strike King Dream Shot at the 2013 Ultimate Fishing Show Detroit. Jonathan VanDam - Kevin VanDam's nephew - and Nate Wellman joined Kevin VanDam in qualifying for the recently completed 2013 Classic and both fared reasonably well, finishing 13th and 30th respectively. 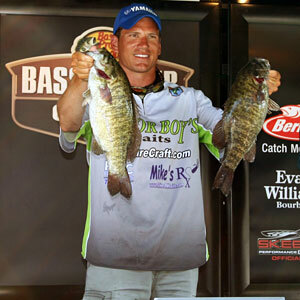 The future looks even brighter for Michigan pros with the recent addition of Chad Pipkens to the 2013 Elite Series. Pipkens, fresh off his 2012 Northern Division victory, is looking forward to his first year on the Elite circuit and believes the schedule, featuring two northern events, is in his favor. His goal for the 2013 season is clear; "I want to qualify for the 2014 Classic", said Pipkens. 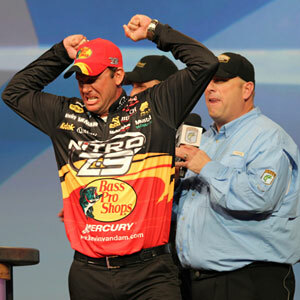 If he's successful, four Michigan anglers could once again compete in the Bassmaster Classic.